To actually come to know the land you exist within, sit in an unconventional place and be surrounded by nature for a period of time. Go beyond viewing the beauty of a sunset and be enveloped in the landscape taking in the nuances revealed to you. Sit and watch as a painter would. I work at night outdoors directly in nature experiencing all of the elements. I strive to capture the world of nature at night, a mysterious, unique, and magical time. I have discovered that being outdoors at night increases awareness of surroundings and tests emotions. The night is dramatic, senses are heightened, sounds are mysterious and sometimes scary, temperature changes become more distinct, and oneʼs presence in the landscape feels noticeably alone. One becomes more still and more aware of their position in space and backside in the dark of the night. In my nightscape paintings, I try to capture those heightened senses that can overwhelm a participant in the night world. 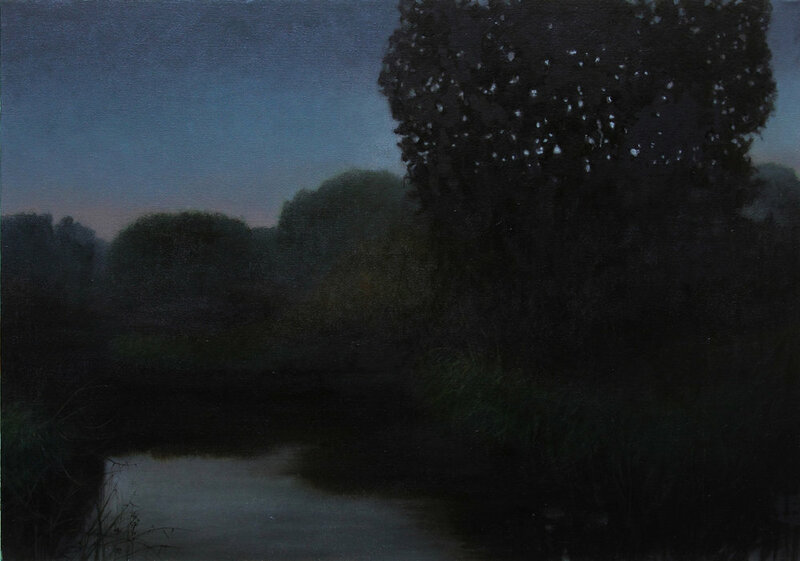 The time, the mood, that stillness is alive in the subtleties of these painted nightscapes. My painting technique is to allow the properties of paint, its fluidity, transparency and opacity to create the imagery and emotion of the moment. My goal is to transcribe the mood of the landscape that I am experiencing rather than rendering a visual copy of the landscape through detail and draftsmanship. I strive to provide the viewer a way in to magical experience of the night. I am an established life-long Wisconsin-based artist. After graduating from UW Milwaukee, I forged a reputation as an aesthetic designer creating large scale murals, decorative painting and canvas wall coverings that have enhanced residential and commercial interior spaces throughout Wisconsin and northern Illinois. Trained and educated in the art and design field, I have successfully created one of a kind artwork for global corporations. I have collaborated successfully with interior designers and architects. To keep my talents honed, I work as a plein air and studio painter. 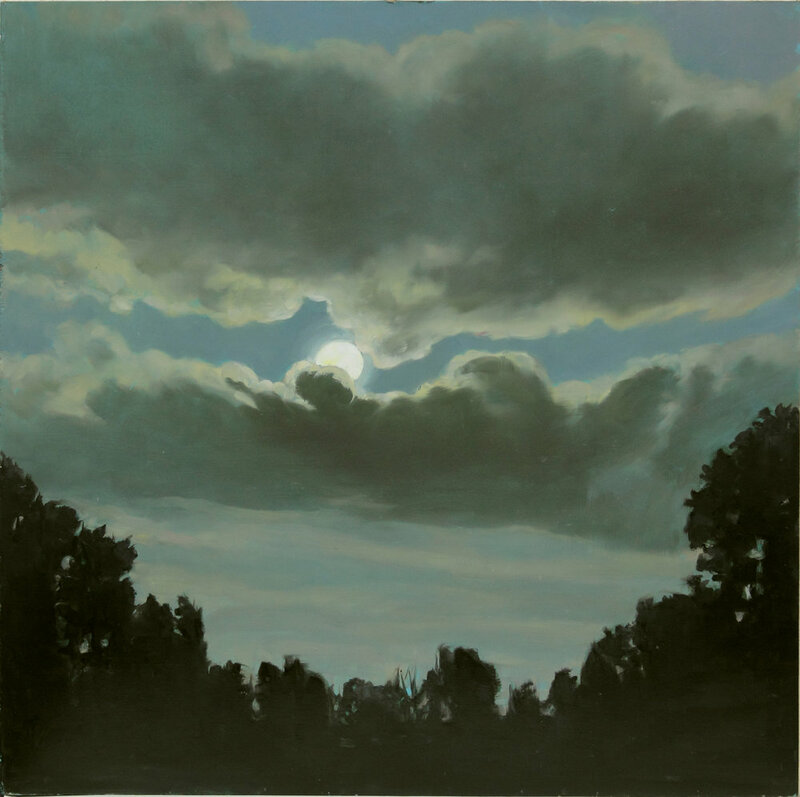 I became fascinated with nocturne paintings; for the last few years I have been painting the landscape at night. My web page includes my nocturne paintings and reflects the variety of work I’ve created for a diverse customer base. You can find a video of me featured on the PBS Arts Page in September of 2016 by googling my name. From an early age, my family encouraged me to engage in art. My father was the advertising director for Wisconsin Electric and my mother was a gifted home baker, textile artist, and seamstress. I always had ample art supplies and paper because my parents valued art. They worked to foster my talent and love for making art. My older brother was a commercial artist in Milwaukee. I would visit him in his studio when I was in elementary school – he'd set me up with my own pencils, paper, and paints and we'd work side-by-side making art. In school my teachers recognized my talent and often would pull me out of class to create art, posters etc. for the school. My parents set me on the road to becoming an artist; they nurtured my talent, and encouraged my development as an artist. I know of people who push their sons away from art in favor of sports or towards "real jobs" but my parents conveyed to me that art was good and for that I am grateful. I was born into an artistic family. My family – both parents, sister, and brother – identified as artists. Thus from my earliest understanding of myself as an independent being, artist was part of my identity. In addition to art, I love the outdoors. I spend a lot of time outside, working and in recreation. I am inspired, intrigued and amazed by natural beauty and lighting. I have joined my inspiration from art history and great painters of the past with my love of nature in my nocturne and plein air paintings. I made so many pieces of art – it's hard to remember! I wish I had classic drawing lessons with a live model when I was in elementary school. Don't give up. Get a good foundation education in drawing and draw a lot. Strong drawing skills are key. I've been a commissioned artist for over 30 years creating commissioned works of art for commercial and residential clients. I've also worked in interior design. Commissioned works of art are design for particular environments and clients. I've been using my creative talents in all my job related endeavors. Yes, I do enjoy showing my art in groups and having the public enjoy it. Work in process is a struggle for me and I prefer to not show it. I'm open to comments on a work in process and I often have people paint a mark or two on a work in process. It is interesting to see how someone else sees and approaches your work. No, just happy to get out of bed each morning. I always loved nocturne paintings (night paintings) Some of my favorite paintings are James Whistler's nocturne paintings. I always wanted to get back to painting for myself. I went back to the basics and started doing plein air painting. Painting directly outside in nature has given me the opportunity to start and finish a painting. I had no excuse because the subject matter was right before me. With my commissioned works of art I have to learn how to use values in color. 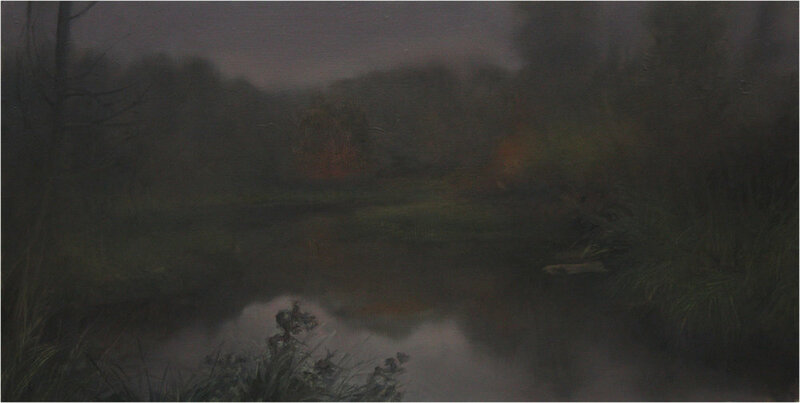 Painting at night is all about using subtle values in color to transcribe the night landscape. 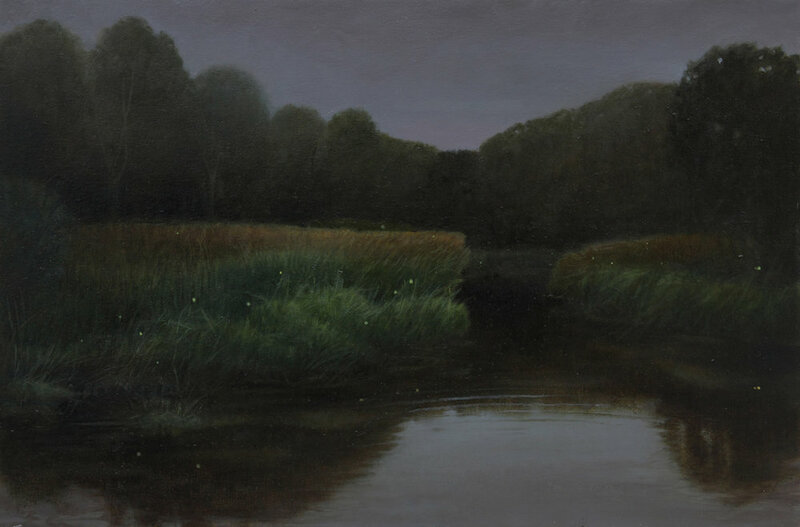 Most of my process is using transparent oil glazes to master the value changes in the night landscape. I enjoy the process of working directly outside in nature. I find that looking directly at the subject is most natural for me to record what I see. Being surrounded by nature with its sounds and movements adds to the atmosphere and image that I depict on the canvas. A work of art is never really finished. A great masterpiece is established with the first mark. My paintings are done when the thoughts and images in my mind's eye are mirrored on my canvas. I want to transport people to the stillness of the evening landscape to share with them appreciation for nature and its harmonies. Most likely because I was weaned on it at a young age; creating art is part of who I am. It’s an integral part of my identity and life. Artists are the forward thinkers, the risk takers, the inspiration. The arts help us to understand ourselves and lives by providing ways to express profound life experiences that often cannot be expressed adequately in words. Creating art allows each of us to authentically be ourselves. The arts provide a way for people to communicate deep, meaningful emotions and experiences that often cannot be expressed in words. Through the arts, it’s possible for people to express themselves in a language that bridges differences and increases mutual understanding.